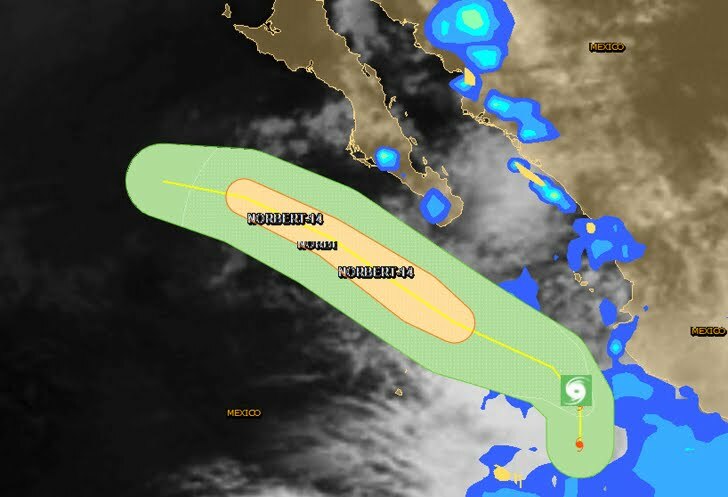 Tropical Storm Norbert, the fourteenth named storm of a busy eastern Pacific hurricane season, has formed off the Mexican Pacific coast and may strengthen into a hurricane. Unlike the most recent trio of Karina, Lowell, and Marie, Tropical Storm Norbert will not simply be an "out-to-sea" wave generator. While Norbert's center may never make landfall, it is expected to creep very slowly to the northwest over the next several days, remaining close enough to parts of southwest Mexico and the southern Baja Peninsula to produce some high surf and rip currents and locally heavy rain. At 17:00hr PDT the center of Tropical Storm Norbert was about 230 km - 145 mi W of Manzanillo Mexico, about 570 km - 355 mi se of the southern tip of Baja California. Norbert getting better organized as it moves northward. A tropical storm watch is in effect for La Paz to Santa Fe, Mexico. A tropical storm watch means that tropical storm conditions are possible within the watch area generally within 48 hours. Norbert is forecast to turn toward the northwest overnight and then turn toward the west-northwest by late Wednesday into Thursday. 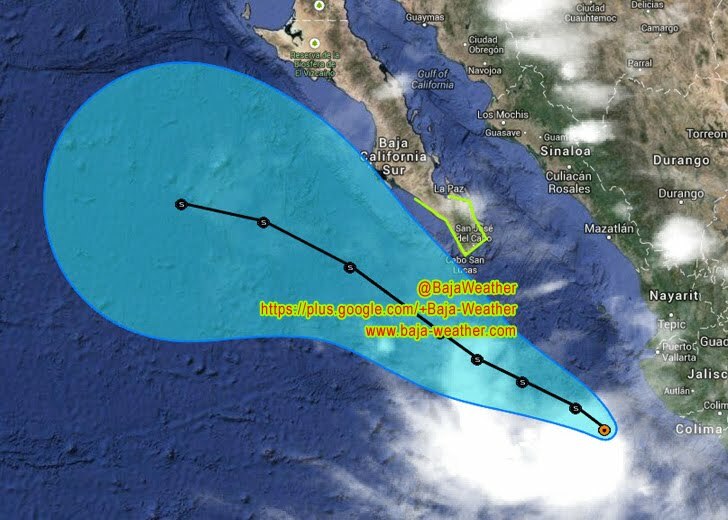 On the forecast track Norbert should begin moving away from the coast of southwestern Mexico overnight and approach the southern tip of the Baja California peninsula on Thursday. Maximum sustained winds have increased to near 75 km/h with higher gusts. Some additional strengthening is forecast during the next 48 hours.